The rising cost of energy and pressure for facilities to become more efficient is quickly driving data centers to adapt solutions to better manage and plan for their day to day operations. A successful DCIM solution deployment allows a manager to understand, manage and optimize the myriad amounts of data under their control. A recent study conducted by Morar Consulting, in conjuction with Intel DCM and Schneider, delves into the he current state of DCIM solution adoption across, title and organization, to gain a granular understanding of the current reception, benefits, and barriers to implementation within US and UK -based enterprises. Implementing a new process while also managing the everyday ebbs and flows of data management is a significant and potentially daunting task. As such, managers usually experience a significant daunting task. As such, managers usually experience a significant tipping point before bringing in a DCIM solution to the process. More than half (57%) of managers identified needing to solve manual, time-intensive problems through automation as the primary catalyst for seeking a DCIM solution. This truly illustrates the climate of data center management today – technology is taking a front seat to automate manual and laborious tasks, allowing managers to refocus efforts on higher level, bigger picture projects. Do you currently have a DCIM solution deployment in place? 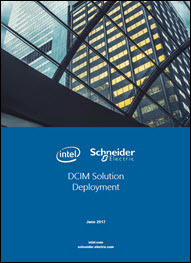 To learn more about successful DCIM solutions and how to deploy them download this white paper. How many physical servers do you have/manage?